After 25 million downloads of the beta, Microsoft releases Internet Explorer 9 Release Candidate (IE9 RC) which runs on the Windows 7 operating system. Microsoft has announced the availability of the Release Candidate of Internet Explorer 9. 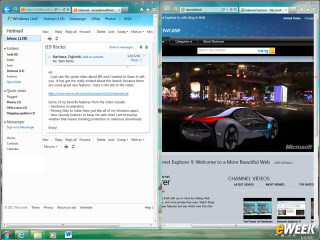 The release candidate, known as IE9 RC, is available at www.BeautyOfTheWeb.com in 40 languages, said Dean Hachamovitch, corporate vice president for Internet Explorer at Microsoft, in a Feb. 10 blog post. Hachamovitch said with IE9 RC, Microsoft has incorporated more than 17,000 pieces of feedback about IE9 and has moved the browser forward in terms of performance and standards, user experience, and safety and privacy. “The graphics engine is smoking fast. That means we can do really cool things,” said Grant Skinner, chief architect and CEO at gskinner.com. In addition, IE9 continues to deliver privacy improvements, Microsoft said. In addition to shipping Tracking Protection with IE9 RC, Microsoft has four Tracking Protection Lists live and available for customers to use. Current Tracking Protection Lists include Abine, TRUSTe, PrivacyChoice and AdBlock Plus. As for hardware acceleration and interoperability in the latest release, according to the SunSpider benchmark, IE9 RC is 35 percent faster than Internet Explorer 9 Beta—322 ms in the beta versus 209 ms in RC. Meanwhile, Microsoft continues to implement standards as they become stable and IE9 RC supports Geolocation, playback of H.264-encoded video using the HTML5 video tag and now WebM video as well, when a VP8 code is installed on Windows. Other developers also weighed in on the IE9 RC. “With IE9 the browser gets out of the way,” said Danny Riddel CEO of Archetype. “I think that they’ve done a really fantastic job of removing the things you don’t need and it lets you focus on the content, which is the reason we’re on the Web anyway,” said Robbie Ingebretsen, a principal at Pixel Lab.